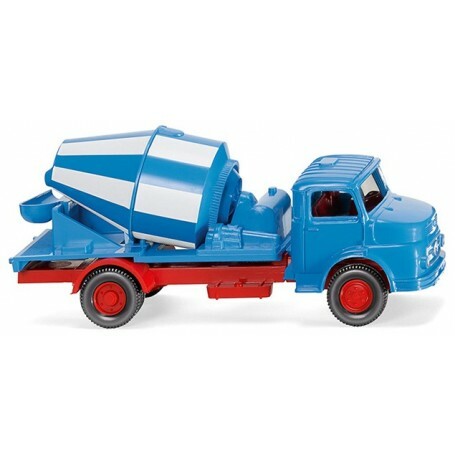 Concrete mixer (MB short-bonnet) - blue/white, 1969. Driver's cab with radiator grille sky-blue, chassis and Cardan part traffic red. Wheel rims also traffic red. Interior with steering wheel red-brown. Superstructure, chute and drum sky-blue with imprinted white stripes. Radiator grille with silver painted Mercedes-Benz star and ornamental frame. Front headlamps hand-painted in silver, tail lights in carmine red.